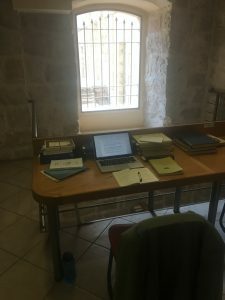 As some of my readers — and twitter and instagram followers — know, I was awarded an NEH Fellowship from the Albright Institute in Jerusalem to work on my next book project, tentatively titled “Sacred Travel in the Roman Empire and the Making of Christian Pilgrimage.” I arrived in Jerusalem in late August and I plan to be here working on the project until early April 2018. 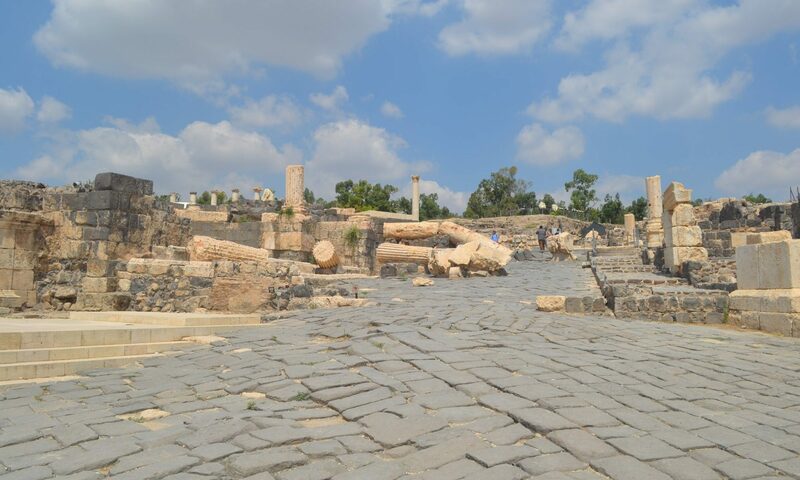 The project examines literary sources, as well as artifacts, architecture, and other forms of material culture related to pilgrimage in the Roman and early Byzantine periods. I’m particularly interested in examining the search for authentically sacred places by late Roman and early Christian pilgrims, how religious authenticity was defined, and the role that pilgrimage souvenirs played in demonstrating the authenticity of pilgrimage destinations and the authenticity of the pilgrim’s experience. I’m also exploring the economic impact of pilgrimage — particularly souvenir production and circulation. So, while much of my time here will be spent in the library, I’ll also be visiting pilgrimage sites, tracing pilgrimage routes, and examining objects like pilgrimage souvenirs produced in the early Byzantine period. 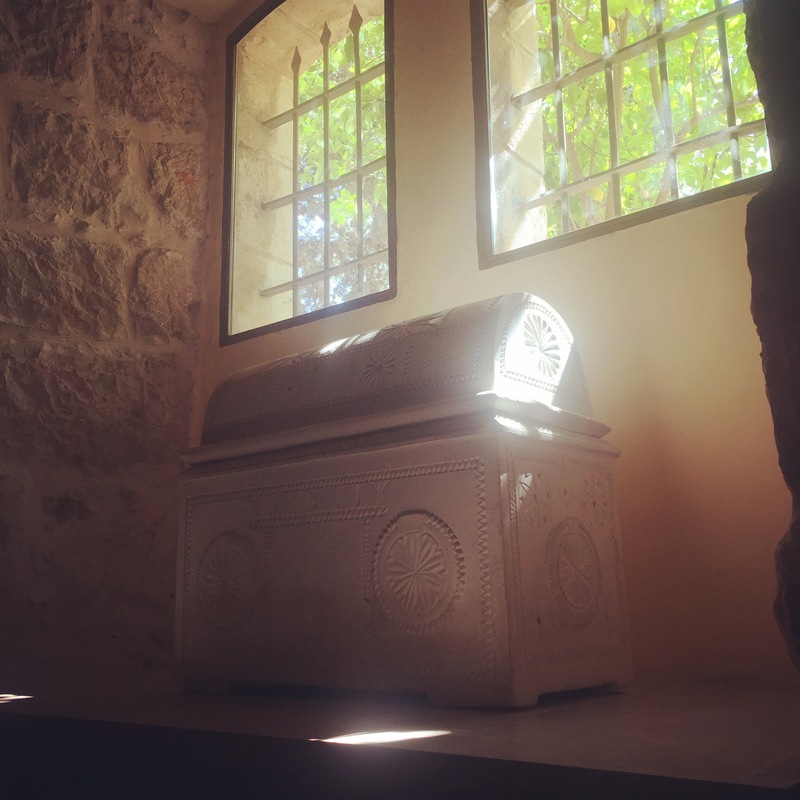 I’ll plan to update the blog as I visit sites and consider pilgrimage objects. In the meantime, however, I thought that some readers might like to see where I’m doing my research while in Jerusalem. Much of the time, I’ve been using the library and research spaces at the Albright Institute, where I have a very nice carrel in the library. The Albright library contains a distinctive collection of archaeological publications and archival materials. 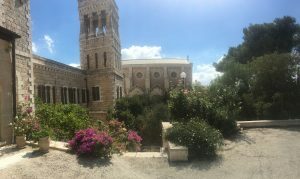 More than that, the Albright is unique location in Jerusalem to meet with scholars from around the world who are working on projects related to the Holy Land. 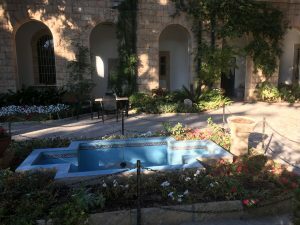 It is also a very pleasant location in which to think, read, and write — as seen in the image of the courtyard below, where tea is taken at 4 p.m. and where I have been eating lunch. 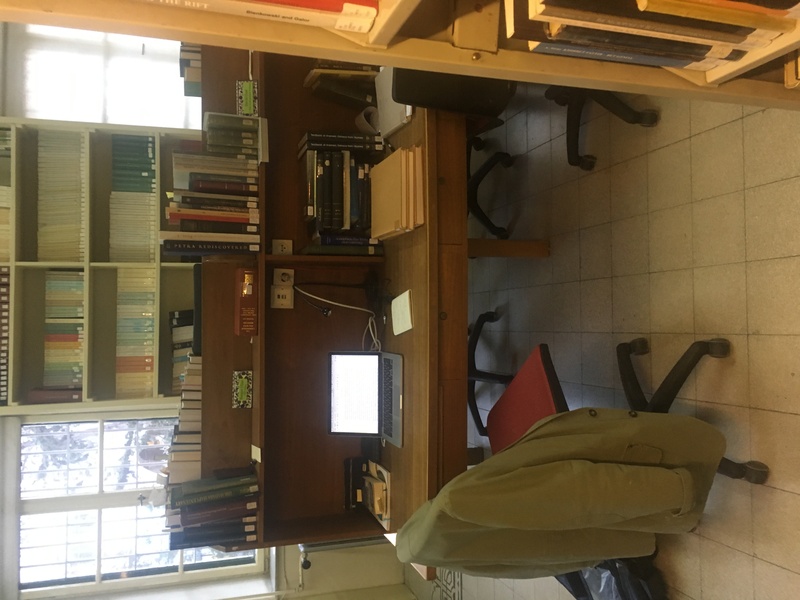 Another advantage of working at the Albright is the close proximity to other research facilities, such as the Rockefeller Library and Museum and the Bibliotheque St. Étienne at the École Biblique and Archéologique française de Jerusalem. I’ve been spending much of time at my reserved desk space at the École biblique, where there is an excellent collection of material related to late antique Christianity in the Holy Land. When I’ve drawn attention to some books that I thought they should have, they have offered to acquire them for the library. 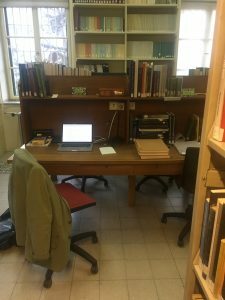 It’s been a great place to work and do some bibliographic exploration. It’s also a very inspiring setting as you can see in the images below. I plan to keep posting once a week or so with images related to my research. So, stay tuned! Sounds like amazing research, Rangar and great facilities and opportunities to conduct it. I look forward to following more of your work there over the next few months.